Into the Woods is an upcoming American musical fantasy film produced by Walt Disney Pictures. It is directed by Rob Marshall, adapted by James Lapine and features an ensemble cast including Meryl Streep, Emily Blunt, James Corden, Anna Kendrick, Chris Pine, Lilla Crawford, Daniel Huttlestone, Tracey Ullman, Christine Baranski, Mackenzie Mauzy, Billy Magnussen, and Johnny Depp. Based on the Tony Award–winning eponymous Broadway musical by Lapine and Stephen Sondheim, the film is a fantasy genre crossover centered on a childless couple, who set out to end a curse placed on them by a vengeful witch. 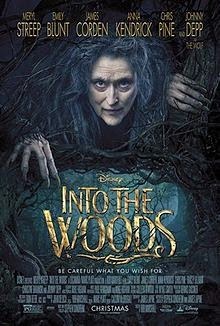 Into the Woods will be released on December 25, 2014, and is also Disney's first theatrical adaptation of a Broadway musical.